I hope YOU are finding ways to enjoy the spring weather…summer is almost here! I find this time of year is wonderful for making short pleasure trips over a long weekend. The weather is near perfect, and the places I like to visit aren’t yet too crowded with summer travelers. 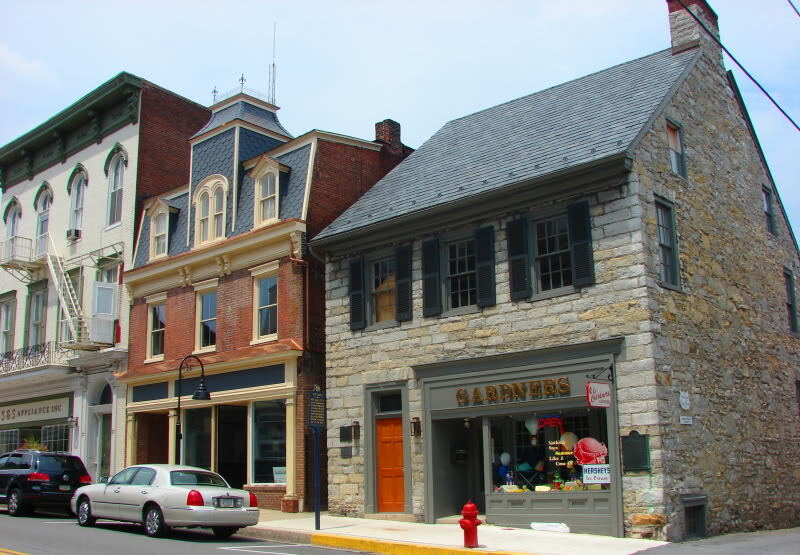 Last weekend, my family booked a long weekend in Bedford, PA: an historic little town about mid-way between Philadelphia and Pittsburgh on the Pennsylvania turnpike. We chose for our lodging a quaint little place called Spring Meadow Farm. 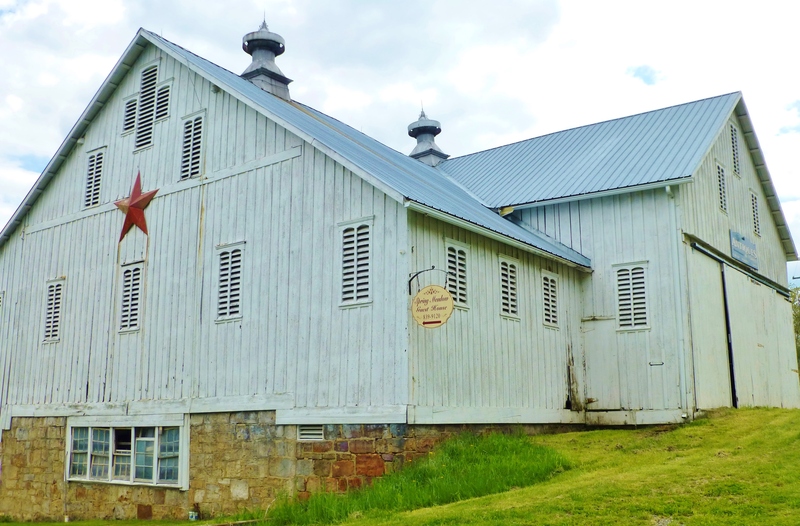 This amazing barn is found at the entrance to Spring Meadow Farm. The homeowners of this historic site, have a lovely little guest cottage they rent out. They live in this beautiful brick house and have a store on the property with antiques and early-American reproductions. 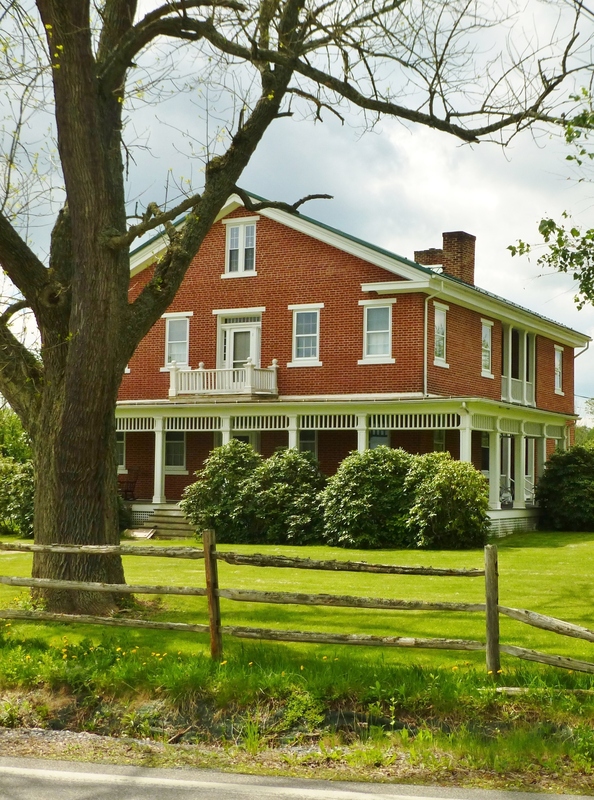 The main house at Spring Meadow Farm once entertained American presidents, visiting the area for to ‘take the waters’ at Bedford’s many springs. The modest guest house where we stayed is clean and decorated with quaint early-American reproductions. It has 3 bedrooms, 2 bathrooms, a kitchen, and laundry, plus an ample living area, dining room, and a wonderful screened porch…everything you need for a relaxing visit! 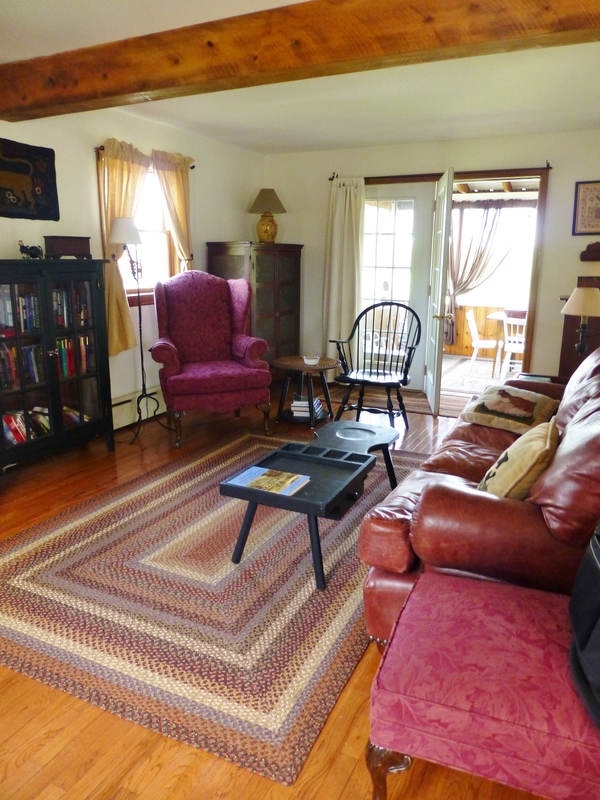 The living room at the Spring Meadow Farm Guest House is decorated in early American style. 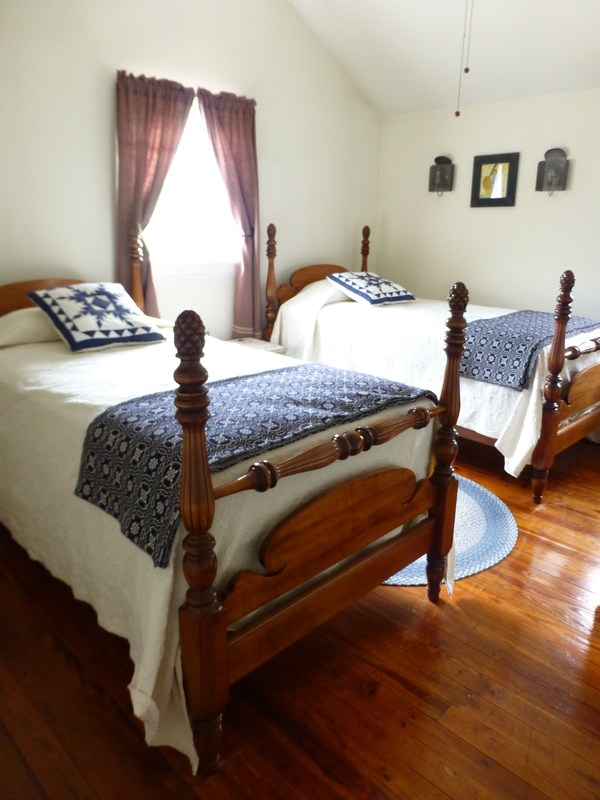 One of the comfortable guest bedrooms at Spring Meadow Farm’s guest house near Bedford, PA. 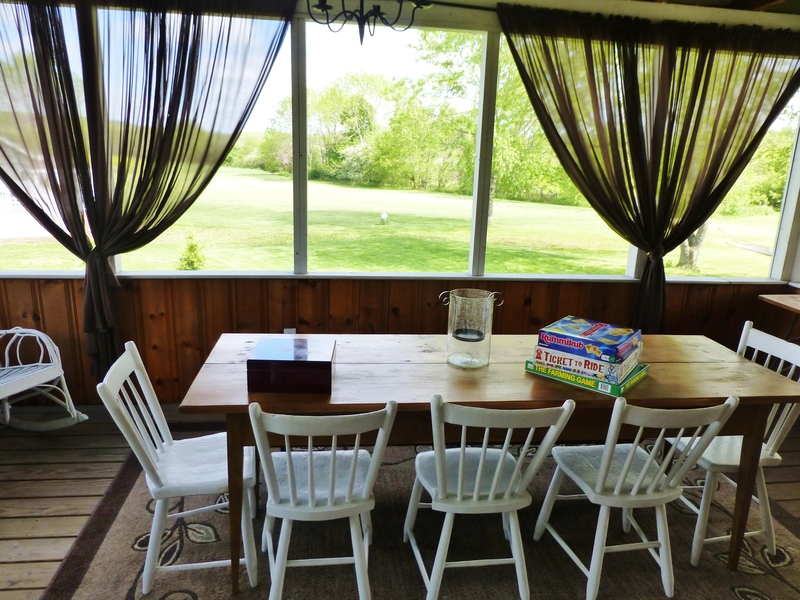 The screened porch is perfect for playing games and watching the scenery. Farm living at its best! The farm was very picturesque and it was so relaxing to sit on the screened in porch and look out at the fields and hills. 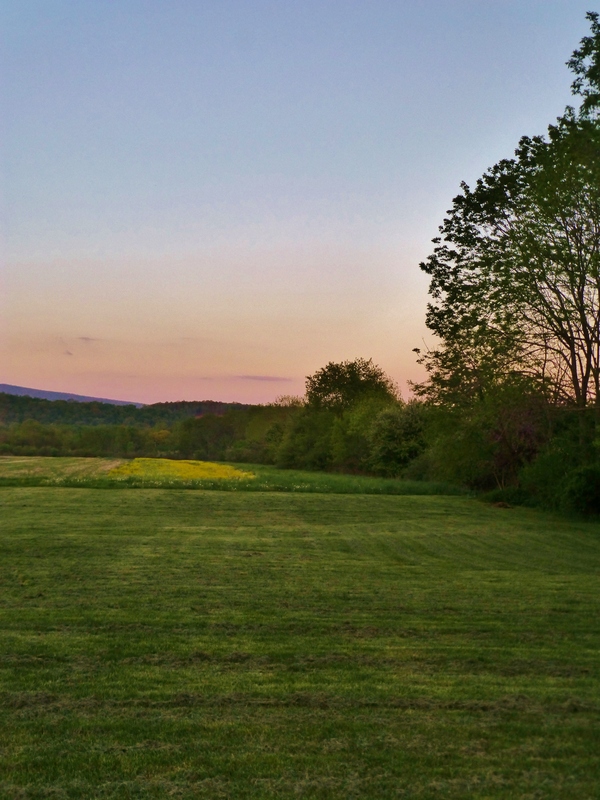 Sun setting over the hills and fields behind the guest cottage. Perfect! 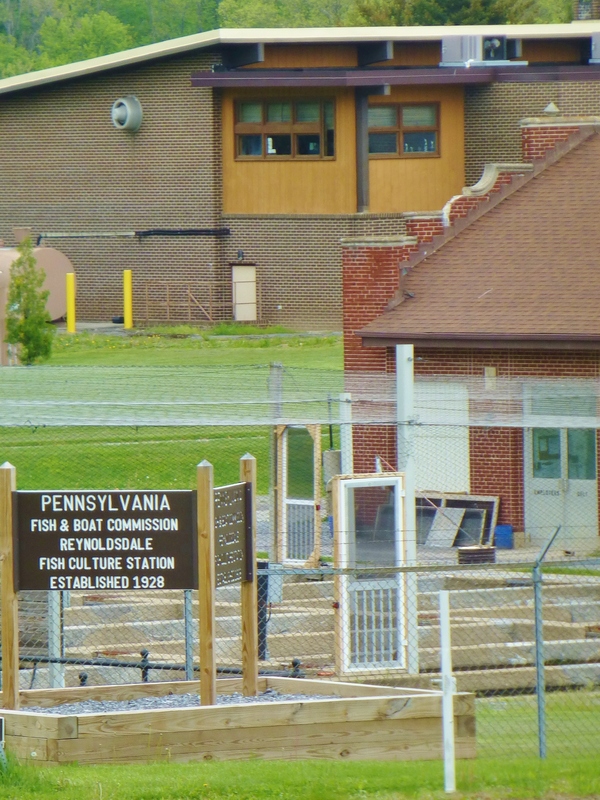 The farm is also across the street from a fish hatchery. One day we walked across and toured the facility…it was fascinating to see all the different types of trout that were being raised. The Reynoldsdale Fish Culture Station provided education about raising trout and stocking local streams. It’s in walking distance, just across the street from the Spring Meadow Farm. 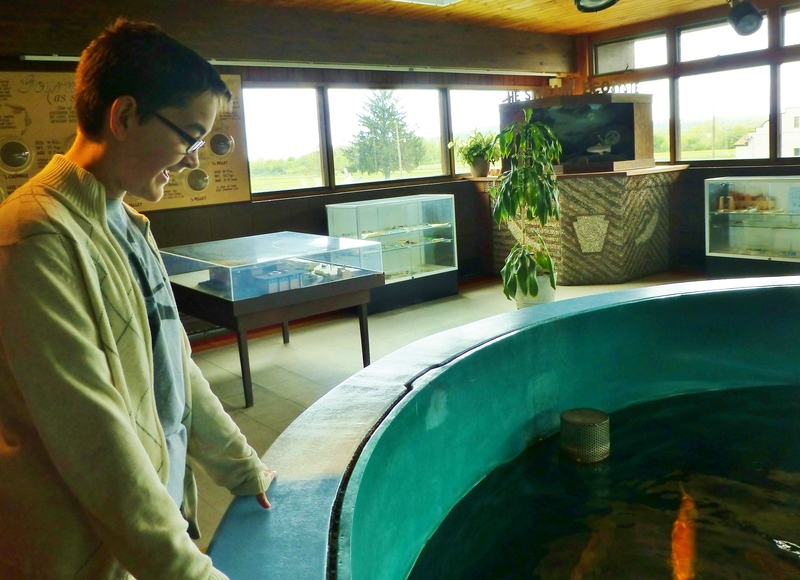 Grady enjoys watching the fish in a giant holding tank, which can also be viewed through portholes on a lower level. There is so much to learn about the local wildlife from this exhibit! 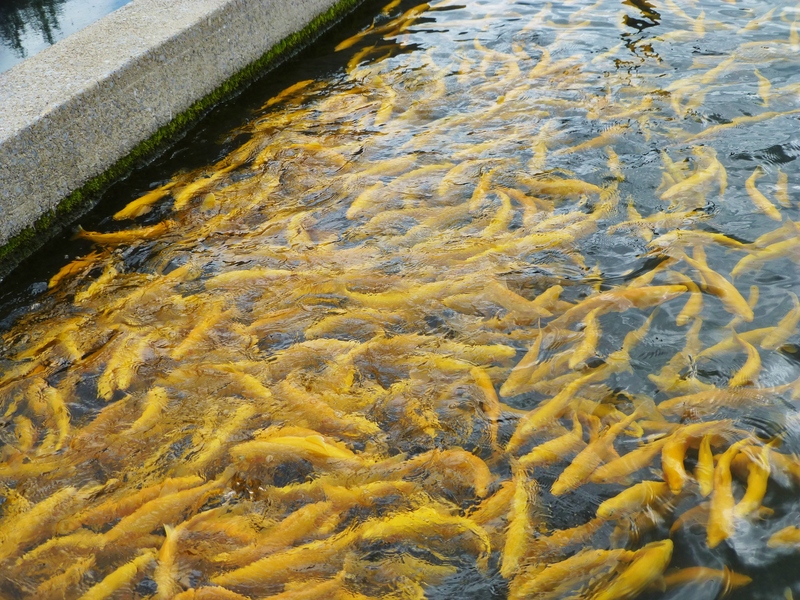 One type of trout grown at the hatchery is the golden rainbow trout. They are a deep golden-yellow in body color, with pinkish lower fins, pink or red tones on their cheeks and with the rainbow’s reddish lateral stripe. There is no spotting on the body or fins. The Pennsylvania record golden rainbow trout is over 13 pounds. 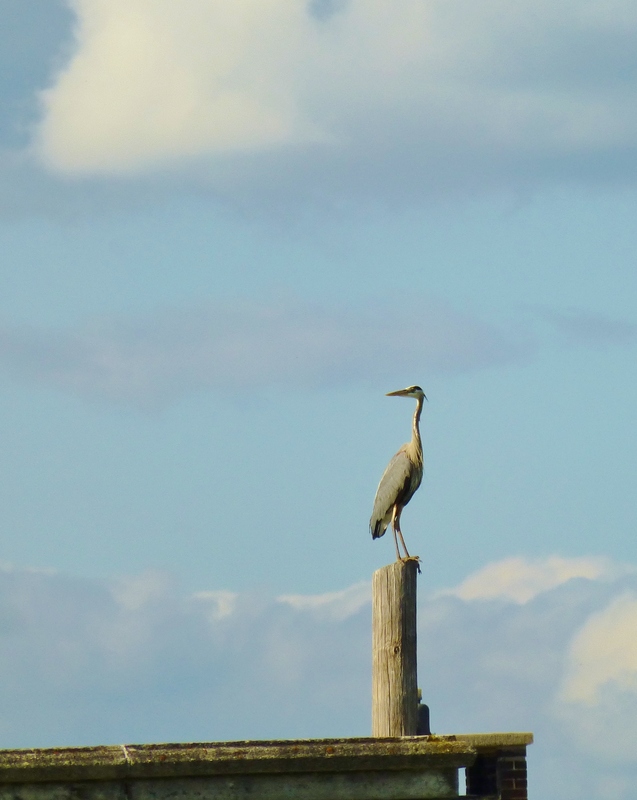 The herons also liked visiting the site–if herons had lips, I’m sure they would have been smacking! Herons were frequent visitors at the hatchery. Another enjoyable part of the weekend was visiting downtown Bedford and its quaint shopping district. Downtown Bedford has a quaint old-timey feel and lots of shopping opportunities! Lots of dress shops, sporting outfitters, and my favorite, antiques stores/malls. I found several items to add to my own collection and enjoyed a relaxing day of browsing in the old-fashioned main street location. 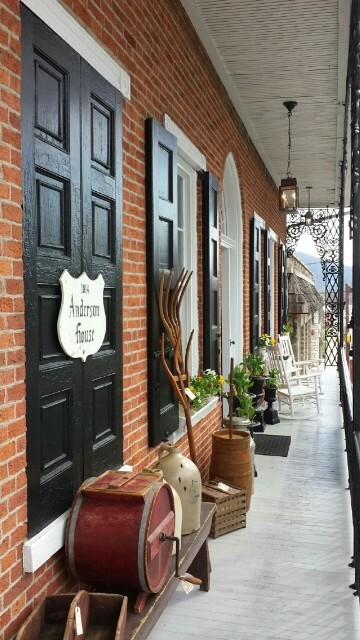 One of my favorite shops was Anderson House Antiques on East Pitt Street. It’s an historic home, filled with period furnishings and decorative accessories. I bought several things there, and enjoyed chatting with Huston Godwin, one of the owners. 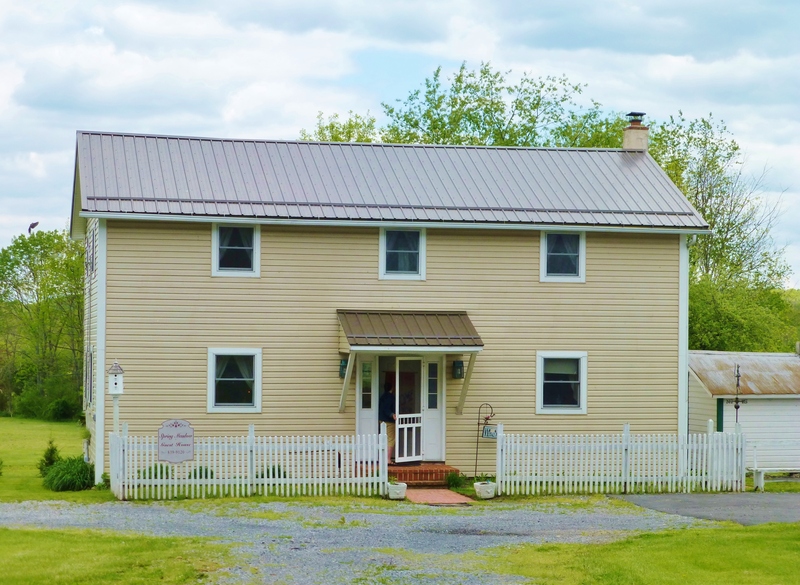 If you’d like to visit Spring Meadow Farm and stay in the guest house (which is very reasonably priced), you can visit their website here: http://www.springmeadowantiques.com/ This is a three bedroom home with 2 full baths, a washer and dryer, a full kitchen, cable tv, a great back porch with an excellent view for relaxing. The homeowner, Liza, is a very kind and hospitable hostess. The house is very clean, and has everything you need for your stay! 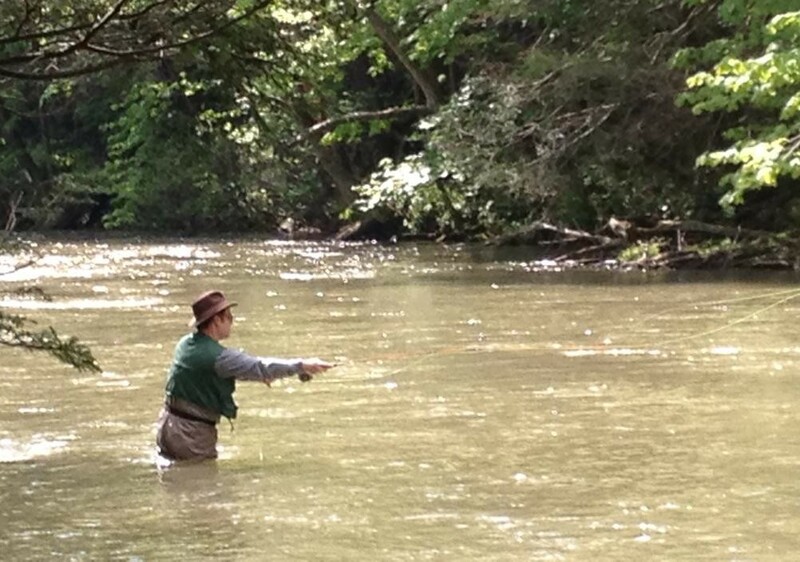 The real reason for our trip to Bedford was fly fishing. This is a photo (taken by a friend) of my husband enjoying the moment. Unfortunately the streams were a bit swollen from spring rain. But we still had a wonderful mini-vacation! I hope YOU are finding ways to enjoy the spring weather…summer is almost here! I’ll be posting more about Blairsden: The Mansion in May in my upcoming posts. There are so many more images of the beautiful designer house rooms to share with you!! Until then, please feel free to comment and share your thoughts with me about this relaxing farm trip…are you inspired by travel? And please, tell everyone you know about Kristine Robinson’s Blog–I need all the friends I can get! This entry was posted in Bedford, Farm, Historic Sites, Pennsylvania, Travel and tagged Anderson House Antiques, Antiques, Antiquing, Barn, Bedford County, Bedford Springs, Fishing, Guest Cottage, Guest House, Hatchery, Shopping, Spring Meadow Farm, Trout, Weekend Trip. Bookmark the permalink.